Using content controls you can create a form with input fields that can be filled in by other users, or protect some parts of the document from being edited or deleted. Content controls are objects containing text that can be formatted. Plain text content controls cannot contain more than one paragraph, while rich text content controls can contain several paragraphs, lists, and objects (images, shapes, tables etc.). or select a text passage you want to become the control contents. switch to the Insert tab of the top toolbar. click the arrow next to the Content Controls icon. choose the Insert plain text content control option from the menu. The control will be inserted at the insertion point within a line of the existing text. Plain text content controls do not allow adding line breaks and cannot contain other objects such as images, tables etc. or select one or more of the existing paragraphs you want to become the control contents. choose the Insert rich text content control option from the menu. The control will be inserted in a new paragraph. Rich text content controls allow adding line breaks, i.e. can contain multiple paragraphs as well as some objects, such as images, tables, other content controls etc. Note: The content control border is visible when the control is selected only. The borders do not appear on a printed version. Controls can be moved to another place in the document: click the button to the left of the control border to select the control and drag it without releasing the mouse button to another position in the document text. You can also copy and paste content controls: select the necessary control and use the Ctrl+C/Ctrl+V key combinations. Replace the default text within the control ("Your text here") with your own one: select the default text, and type in a new text or copy a text passage from anywhere and paste it into the content control. Text within the content control of any type (both plain text and rich text content controls) can be formatted using the icons on the top toolbar: you can adjust the font type, size, color, apply decoration styles and formatting presets. It's also possible to use the Paragraph - Advanced settings window accessible from the contextual menu or from the right sidebar to change the text properties. Text within rich text content controls can be formatted like a regular text of the document, i.e. you can set line spacing, change paragraph indents, adjust tab stops. Select the necessary content control, click the arrow next to the Content Controls icon at the top toolbar and select the Control Settings option from the menu. 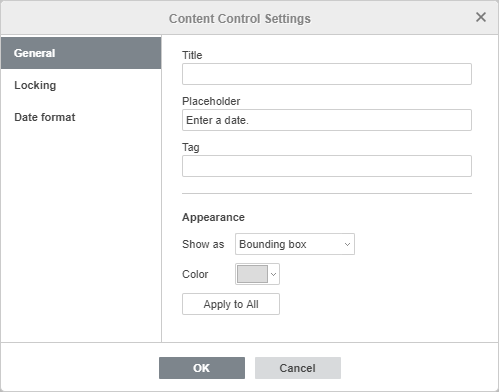 Right-click anywhere within the content control and use the Content control settings option from the contextual menu. Specify the content control Title or Tag in the corresponding fields. The title will be displayed when the control is selected in the document. Tags are used to identify content controls so that you can make reference to them in your code. Choose if you want to display the content control with a Bounding box or not. Use the None option to display the control without the bounding box. If you select the Bounding box option, you can choose this box Color using the field below. Content control cannot be deleted - check this box to protect the content control from being deleted. Contents cannot be edited - check this box to protect the contents of the content control from being edited. Select the necessary color on the available palettes: Theme Colors, Standard Colors or specify a new Custom Color. To remove previously applied color highlighting, use the No highlighting option. The selected highlight options will be applied to all the content controls in the document. Click the arrow next to the Content Controls icon at the top toolbar and select the Remove content control option from the menu. Right-click the content control and use the Remove content control option from the contextual menu. To remove a control and all its contents, select the necessary control and press the Delete key on the keyboard.